I sometimes look at software like a cook looks at kitchenware. If Google Chrome and MS Word are like my favorite non-stick pan and cutting board that I use every day, Web Link Captor (free/donationware) would be a cherry pitter, something I would need maybe once every few months for a very specific task--but does its job like no other tool can. 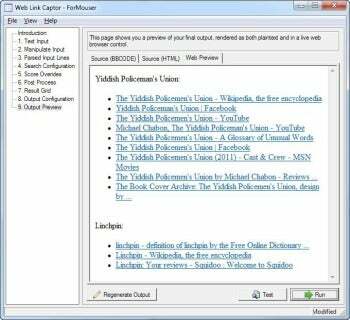 Web Link Captor runs multiple Web searches for a list of item, and returns a list of formatted results for use in forums, Wikipedia, etc. You feed Web Link Captor with a list of terms, such as names of books or music albums. It then searches the Web for those terms and compiles a well-formatted list of results for each item. You can then paste this list into a forum post, a Wiki page, or any HTML document. Think about it: How long would it take you to manually create a list with links to the Amazon, Wikipedia, and official homepages of ten different authors (thirty links in all)? This could easily take fifteen-twenty minutes, even if you're fast. With Web Link Captor, you can do this in seconds (after you configure it for the job). Web Link Captor is different from utilities such as wget and curl, which simply download the page or website you point them at (curl actually does a great deal more, but it's not focused on search). But much like wget and curl, Web Link Captor was clearly written for nerds with a strong technical background. The developer, Donationcoder.com's Mouser, took a complex process and broke it into nine clearly-defined steps, displayed as a list along the left side of the window. The first step is entering your text. This can be a straight list of names, but you can also get fancy and include additional information on each line, like a note saying "my favorite album," etc. Be sure to maintain a uniform format, because you will have to help Web Link Captor parse your list in the next few steps. The next step is called Manipulate Input, and here Web Link Captor's technical innards start to show. The application is built as a collection of 74 Python scripts (I counted), and each step makes a few of these available for you to use and configure. This is a very technical process--the scripts have names like "Core.Modify.Process - Change Case," and each script accepts different input options (all briefly explained). Next, you get to review the parsed input lines, to make sure Web Link Captor now understands your list. Now you can to configure search: You can use Google, Bing, Wikipedia via Bing, or Amazon via Bing (great for creating lists of affiliate links). Web Link Captor ranks search results to decide which results to include in the final set for each search term, and you can tweak that ranking algorithm. For example, you can decide that all Amazon results should appear first in your list, regardless of where they appeared in the search results. You can also post process the results, to add your own affiliate tag to each Amazon link, for example. Once you configure any post processing, you can review the result grid, showing what hits Web Link Captor found for each term, and how those hits were scored. You can manually eliminate hits from your final list, and there's an easy way to use wildcards (i.e, never show me anything from The Pirate Bay). Now that you have your results, it's time to configure the output. Out of the box, Web Link Captor speaks fluent BBCode (used for forums), Markdown (used for Wikis), and HTML (used everywhere else). If you need a different format and happen to be a coder, you can always extend Web Link Captor. In fact, you can write your own scripts to extend and customize any other part of the application, too. Once you've gone through the entire process, you finally get to meet your results list, all ready to copy and paste. Web Link Captor lets you save your project, so you won't have to configure it again in the future if you want to run the same procedure using different terms. You can also share the project with other users, so they can just open the project, enter a list of terms, and click Run to get the results they're after. So, you don't necessarily need to be a computer whiz to use Web Link Captor, but you should know your business if you want to configure or extend it. All in all, Web Link Captor is a truly unique product. I don't know that I would use it every day (or every month, for that matter), but I am glad to know it's out there, and available for free (donations welcome).